I love Chick-Fil-A. Now, let me be clear. In no way am I making a political statement by saying that nor am I trying to start some firestorm of controversy. I'm just saying that I like their nuggets. Oh, and their chicken mini sandwiches. And, don't forget the waffle fries. Or their sweet tea. Or the fact that the lady will get your refill for you while you sit and eat. I just like their food. And their service, too. Where else can you count on the fact that when you say thank you, they will always say, "My pleasure." In this day and age, I'm sorta crazy about a place that trains their staff to count it a pleasure to serve the customer. Before I continue, I must make my disclaimer blanket apology to all my Canadian relatives. I promise--I am not rubbing Chick-Fil-A's chicken goodness in your face. I know, I know. Y'all don't have them up there. Here's the best I can do. 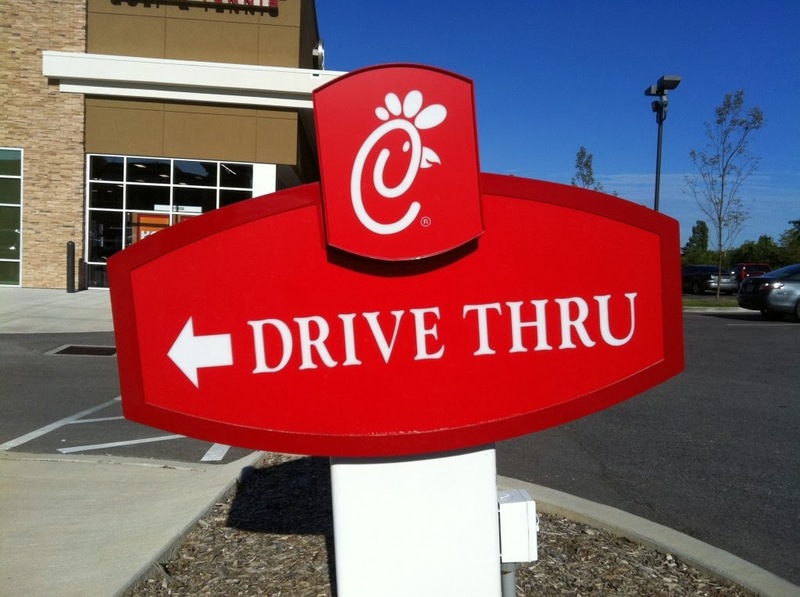 As always, next time you come south for a visit, we will bee line to CFA as we always do. Back on topic. And I assure you--these random thoughts will connect. I've been camping on the passage in Luke 10 about Mary and Martha this year. Really meditating on the call to sit at Jesus' feet. To choose the only thing needed. If you've read my blog in the last few weeks, you'll notice this to be true. that my sister has left me to do the work by myself? Tell her to help me!" "Martha, Martha," the Lord answered. Only one thing is needed. Only one thing is needed. Sit at His feet. Quit being distracted by all the preparations and things to do and activities and task lists and demands of the day. YES! This is my mission for this year. To learn the practice of sitting at His feet. The discipline of posturing myself continually in a quieted place of listening. No matter how busy my day is. I've spent a lot of time dwelling on this passage lately. Read it again this morning. And boom. There it was. The new and fresh revelation. Jesus ain't a Chick-Fil-A drive through. He doesn't sit with the head set on, ready to take my order. Asking if I'd like anything else with that number one, no pickles. Eager to express how it's His pleasure to serve me. Yet, I've approached Him in my faith walk with this sense of entitlement for far too long. I've become complacent and convinced that I relate to Him as if He was a Chick-Fil-a drive through. Or McDonald's or whatever your fast food preference is. I mean, to keep it real, that is the most honest way to express how I've tended to relate to Him. To see Him. To approach Him. And, I am coming to believe that most of the North American church would fall into this same category if we got really honest about it. We walk into our churches with our orders ready. Yes, I'll take the Number Two combo worship, HOLD the rock sounding songs I don't like, please. With extra Chris Tomlin because I know all the words. Oh, and an affirming twenty minute sermon, please. With nothing else added. Hold the conviction and call to do more. Just plain and appeasing, please. And, no, I would not like to upsize to the great opportunities to serve others. Really. Is that not actually what is going on? Don't we tend to treat church like they are so lucky to have us as customers? And Jesus--He should be happy to get our business. Our loyalty. Because we've attached our names to His. So, here we are. Ready and waiting for our good customer service. Like Martha. Go back and read that little passage again. Do you see how she talks to Jesus? "Lord, don't you care that my sister has left ME to do all the work by myself? Tell her to help me!" Insert your best, whiniest, most demanding voice. Which she used on Jesus. Face-to-face. Can you even believe it? Yet, if we were really, really brutally honest with ourselves, how do we approach Him? Do we make demands and place our order and wait for the outcomes and life and ease and comfort that we want? Or do we leave it all behind, and just sit, humbly and in awe, at His feet? "Listening to what He said." Are we worried and upset about the things that aren't going our way? The things we want and aren't getting? The way we feel we've poured ourselves out, exhausted and weary from all our doing? Or, have we chucked all that? So in awe and humbled with the most amazing reverence, do we see the privilege it is to be able to just sit at His feet? Prone in humble adoration? Ready to listen? And do whatever is asked? I'm afraid our first world problems and our convenience and instant gratification culture is infiltrating the church. And we are so focused on what we can and do give that we forget what underground churches and persecuted churches have learned across the world. The fact that we can enter the presence and into fellowship with King Jesus should bring us to our knees. Awestruck by what He's done for us. Content with nothing less than absolute adoration and humbled by the opportunities to be called to kingdom work. No matter the cost. No matter the inconvenience. No matter the danger. Because Jesus ain't no Chick-Fil-A drive through. Jesus is the King of Kings and Lord of Lords and He dares to lavish His love on us to call us His children. That we might sit at His feet, hang on His every word, and be changed by it every day. P.S. Author's note--I do apologize if I've messed up your order today and instead of giving you a contented affirmation I've given you a heap of conviction. I'm finding myself eating lots of crow lately. Thought you might like a taste.